Featherpunk Prime is a vibrant, twin-stick shooter-platformer from Super Hatch Games. Featherpunk Prime is the first title from Super Hatch Games, but despite only releasing one title, the small duo development team is not shy of industry experience as they both have previously worked on the PS VR for Sony. Showing similar qualities to the likes of Contra and Rogue Legacy, Featherpunk Prime is sure to spike interest from fans of the shooter-platformer genre. Featherpunk Prime follows the adventure of a neon pink and blue Cyber-Flamingo as he blasts, boosts, slides and shoots his way past evil hordes of Avian Warbots to rescue his kidnapped friends. As you ascend through the different towers, you will quickly come to realization that Featherpunk Prime is no walk in the park Dodging bullets, projectiles and unexpected traps are just some of the many obstacles you will be faced with throughout the randomly generated levels as you are constantly being engaged in combat. The rapidly paced game will keep you on your toes as you traverse through the levels and you will quickly become accustom to brutal boss battles as the Cybirdroid Guardians unleash relentless waves of attacks upon you. It is quite obvious from the start that the game focuses very heavily on its movement and combat mechanics. The game has over four different movement mechanics that range from boosting through the air, sliding under projectiles, clinging to the walls and crawling through ducts. All of these movements help aid the player throughout the game. Super Hatch Games has really done the movement mechanics right and I can confidently say that with a few further tweaks to the controls, Featherpunk Prime will undoubtedly be a very fluid moving game. Another nice feature to the game is the wide range of different weapons that are available for the player to use. At first, the player begins with a simple pistol There are six weapons available, with new weapons spawning the further the player gets. The downfall is that the player is only able to hold two guns at a time, but with different weapons spawning each level, it is easy to swap them when needed. As you progress through the game, you will start to upgrade your weapons with the Tekcells that are collected throughout each level. 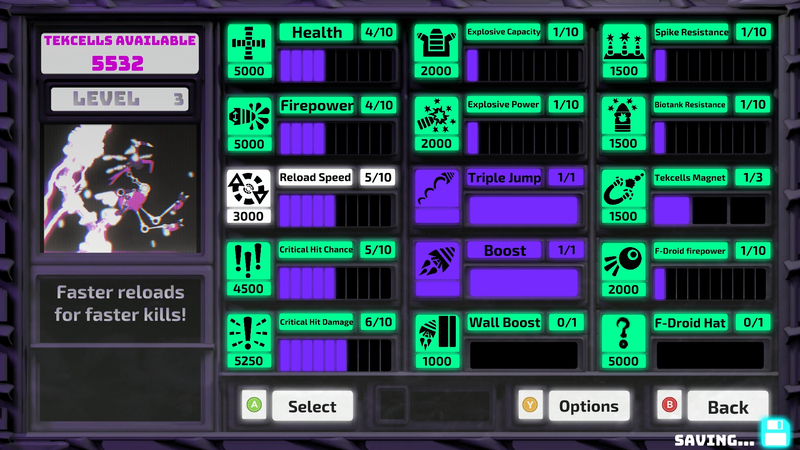 The more Tekcells you collect, the more add-ons you can have on your gun. If you want any chance of surviving the later levels, upgrading your weapons is a must. Not a lot of games can do this genre well -- however -- Featherpunk Prime has managed to successfully do a lot of the platforming elements right. This helps make the game so much more enjoyable to play -- when you aren't dying that is --. Each level within Featherpunk Prime is randomly generated, which perfectly suits the games style of play. From testing -- I died a lot -- I can confirm that each level I revisited was different, but after multiple play throughs I can begin to see sections that were recycled but placed in a different order. While this doesn't affect the game play, it did make some sections of the levels just a tad more predictable and a little easier. Even with the more predictable sections, I still died a lot. Having levels be randomly generated also adds more replay value to the game, as each time it is played the levels will be different. Unless you are a seasoned professional at using a keyboard for gaming, then I would highly recommend using a controller to play through the game or at the very least trying to remap the keys to a much better set up. One of the biggest issues that I found within Featherpunk Prime was the controls as they quite often felt very awkward and sluggish. Throughout my play-through, I used a PS4 controller -- you'll be happy to know that Featherpunk Prime recognizes the PS4 controller and maps its buttons accordingly. While it's quite obvious that the game is designed to be played via a controller, the control scheme still felt very odd even after remapping the controls. While the controller did help, it still required a bit of a learning curb to get it to feel more comfortable. Featherpunk Prime really is a love/hate relationship because while the game is fun and addicting, it is also very challenging -- especially if these types of games are not really your forte. At times it felt as if the randomly generated levels didn't have a balanced difficulty. After a short tutorial of the game, you are essential thrown into the first level of game play which felt as if it should have been -- at the very least -- level five. 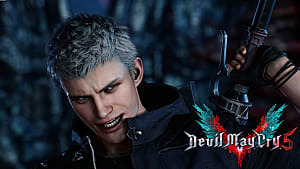 When you tie in the difficulty of the game and the fact that checkpoints are every six levels --meaning if you die at level six, you will need to begin at level one again-- you can quickly start understand why the game can be very frustrating at times. 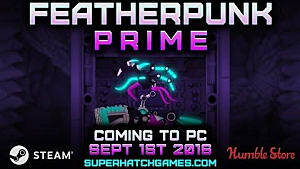 If you are a fan of challenging games, then I can guarantee you will feel right at home with Featherpunk Prime. While game isn't perfect, it is very hard not to recommend Featherpunk Prime to those that are looking for a game that is not only cheap, beautiful and fun but also challenging and addicting enough to make you not want to put the controller down. A review code for Featherpunk Prime was provided by the publisher.